I've been taken captive by the spirit of an evil Mayan warrior. Need help right away! Continue journey as planned -- through the rain forests and mines, past the waterfalls and ruins. But be careful...the Mayan empire is filled with deadly traps and enemies. Think fast and move even faster. Swing from vines, soar off bungees and take a ride in an abandoned mine car as you venture through five action-packed worlds! Watch out for sinister gargoyles, deadly crocodiles, ghostly skeletons and lethal traps -- like fiery pendulums and the wall of tongues! Hidden in the game is the entire original version of Pitfall! Animation by award-winning Kroyer Films! Soundtrack by Academy Award-winning Soundelux Media Labs! 11-07-2016 Flashback2012 Box Text Harry Jr. I've been taken captive by the spirit of an evil Mayan warrior. Need help right away! Continue journey as planned -- through the rain forests and mines, past the waterfalls and ruins. But be careful...the Mayan empire is filled with deadly traps and enemies. Think fast and move even faster. Hurry! Time is running out... PItfall Harry Swing from vines, soar off bungees and take a ride in an abandoned mine car as you venture through five action-packed worlds! Watch out for sinister gargoyles, deadly crocodiles, ghostly skeletons and lethal traps -- like fiery pendulums and the wall of tongues! Hidden in the game is the entire original version of Pitfall! Animation by award-winning Kroyer Films! Soundtrack by Academy Award-winning Soundelux Media Labs! This is a list of VGCollect users who have Pitfall: The Mayan Adventure in their Collection. 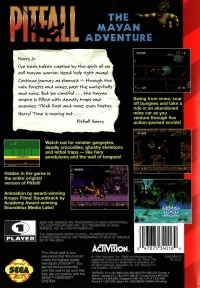 This is a list of VGCollect users who have Pitfall: The Mayan Adventure in their Sell List. 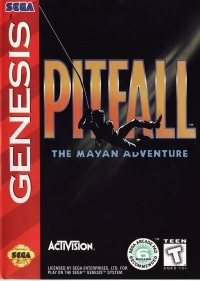 This is a list of VGCollect users who have Pitfall: The Mayan Adventure in their Wish List.